2. 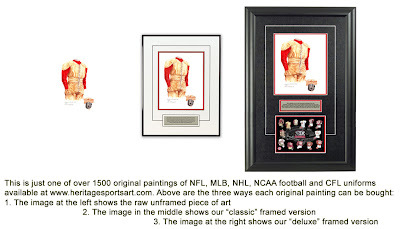 Please note that all of the actual original, one-of-a-kind artwork of the University of Georgia football uniforms as seen in the poster above are actually available for sale. These watercolor paintings are truly beautiful, original watercolor paintings, and there are only 15 of them so please act quickly if you would like to buy one. These would make a wonderfully memorable, beautiful and completely unique gift for someone who loves Georgia football. 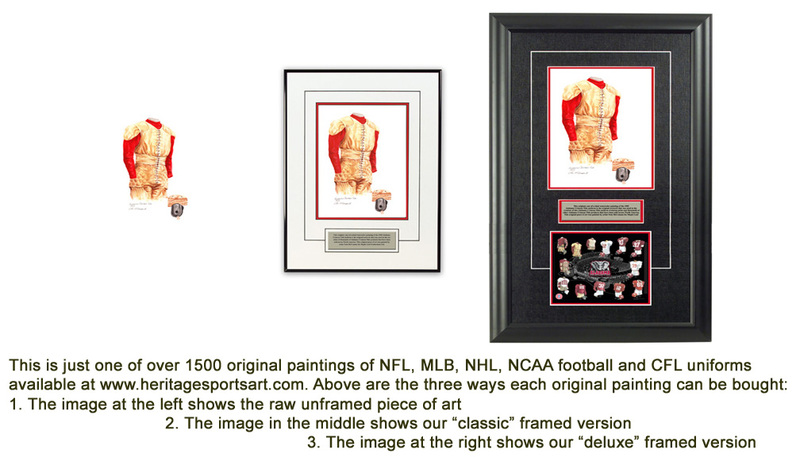 If you would like more information about this great artwork including the three ways you could purchase each piece, please visit our Georgia YouTube video at www.youtube.com/watch?v=WxSzTiSLgpk or go directly to the artwork website www.heritagesportsart.com/Georgia-Bulldogs-c84/ where you can see and purchase the artwork. The University of Georgia is located in Athens, Georgia. The school, which was founded in 1785, has an enrollment of over 32,000 students. The Bulldog football program began in 1892. The Bulldogs football team plays out of Sanford Stadium which seats 86,520. The stadium was constructed in 1929 at a cost of $360,000. Georgia boasts a storied tradition of football; countless Bulldogs have extended their football careers in the NFL, Arena League and the CFL. Notable Bulldog alumni include: Herschel Walker, Fran Tarkenton, Ray Donaldson, Terrell Davis and Champ Bailey. Note: this site is also a good resource for additional past & present NCAA stadiums. If Georgia was nationally ranked in "The Top 20" (or Top 10 in some years) in a particular season depicted in the poster, we show the team’s ranking. That being said, prior to 1936 there was no nationally recognized poll ranking the nation’s top teams, so you will not see any rankings prior to 1936. From 1936 onward, we show the results of one, and then two, end-of-season polls annually ranking the Top 20 (or Top 10) college football teams. There have been various other polls over the years, but we have chosen to show the results of two polls. 1. The Associated Press (AP) Poll began in 1936 and is a poll of sportswriters. It continues to this day. 2. The United Press International (UP) Poll began in 1950 and is a poll of coaches. By 1993 it had became known as the USA Today/CNN poll, and by 1997 the USA Today/ESPN poll. This painting depicts the 1894 University of Georgia football team uniform. The Bulldogs were captained by quarterback George Butler. The 1894 team was coached by Robert Winston, a graduate of Georgia and a former rugby player. Winston also coached Yale, Amherst, Rochester, and Syracuse. He was Georgia’s first ‘paid’ coach. He guided the squad to a 10-8 win over Auburn and a 5-1-0 record in 1894. 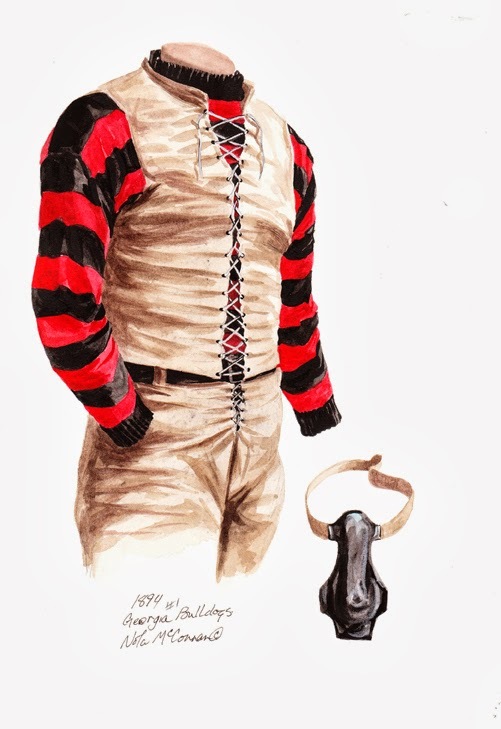 Bulldog players in 1894 sported a light tan vest with laces from the waist to the collar over a black and red sleeved shirt. Players also wore tan colored pants. Uniform numbers did not appear on the uniform front. Helmets were not worn but players sported black nose guards for protection. 1894 marked the third season of college football in Athens. 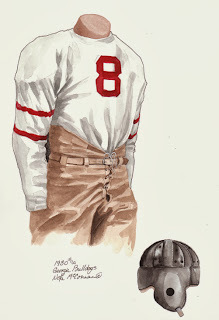 This painting depicts the 1909 University of Georgia football team uniform. The Bulldogs were captained by Fullback - Hugh Bostwich. The 1909 team was coached by James Coulter, a graduate of Brown University. Coulter’s Bulldogs struggled in ’09 and posted a 1-4-2 record, their only win coming over Tennessee (3-0). He was replaced the following year by W.A. Cunningham who led the squad to 6-2-1 record. Bulldog players in 1909 sported a light tan and red vest with laces from the waist to the collar over a black and red sleeved shirt. Players also wore tan colored pants. Uniform numbers did not appear on the uniform front. Players wore tan helmets for protection. 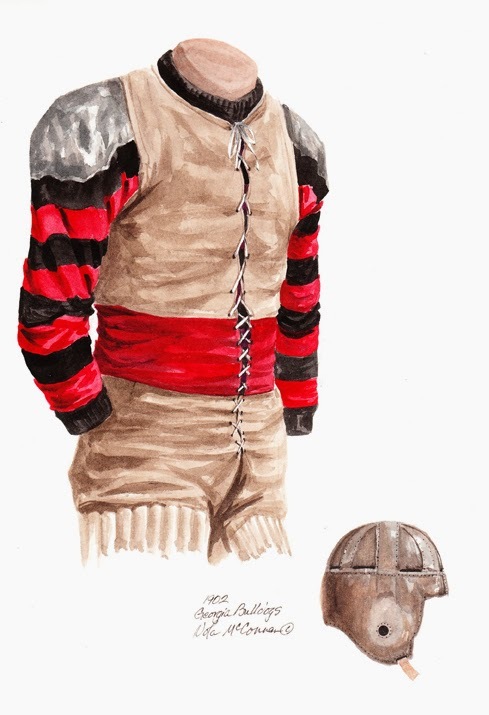 This painting depicts the 1912 University of Georgia football team uniform. The Bulldogs were captained by Guard - D.R. Peacock. The 1912 Bulldogs were coached by W.A. Cunningham who led the team to a 6-1-1 record. Cunningham patrolled the sidelines for 8 years and compiled a 43-18-9 record. Cunningham coached Georgia’s first All-American - Bob McWhorter (1913) and the legendary George ‘Kid’ Woodruff. Bulldog players in 1912 sported red, long-sleeved jerseys with a black collar and tan-colored pants. Uniform numbers did not appear on the uniform front. Players wore a tan-colored helmet for protection. 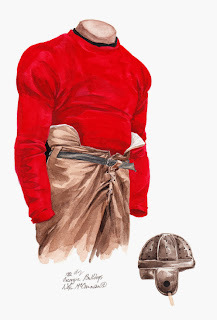 This painting depicts the 1927 University of Georgia football team uniform. The Bulldogs were captained by End Chick Shiver who helped lead the squad to a record of 9-1-0. 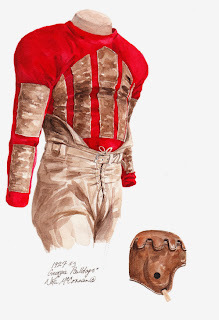 Bulldog players in 1927 sported red, long-sleeved jerseys with tan-colored felt strips on the torso and sleeves. No uniform number or lettering appeared on the front of the uniform but numbers appeared on the reverse of the jersey. Players wore tan-colored pants and helmets for protection. Georgia’s sole defeat in 1927 came at the hands of cross-state rival, Georgia Tech (12-0). 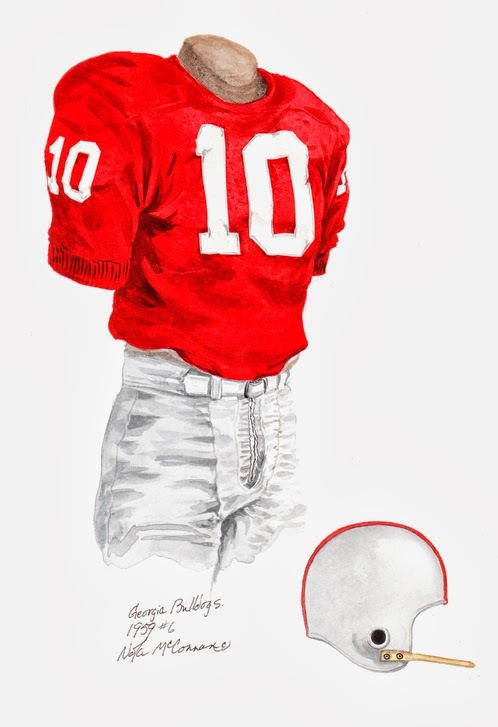 This painting depicts the #8 University of Georgia football team uniform from 1930 that was worn by All-American guard - Ralph ‘Red’ Maddox. Maddox became recognized as Georgia’s eighteenth All-American 32 years after his playing days were over. It was determined that he had made the International News Service All-American team in 1930; however, this honor had never been recorded. Unfortunately, Maddox was not able to enjoy this recognition of his accomplishments. He was killed during the Normandy Invasion of World War II. The 1930 Bulldogs compiled a 7-2-1 record under the tutelage of head coach - Harry Mehre. The squad was captained by End - Herbert Maffett. Mehre coached Georgia from 1928-37 and posted 59-34-6 record. Bulldog players sported white, long-sleeved jerseys with numerals on the front and back. Two red stripes adorned the sleeves at the elbow. Players also wore black helmets for protection and tan-colored pants. 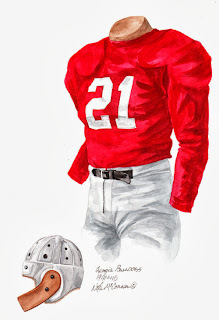 This painting depicts the #21 University of Georgia football team uniform from 1941 that was worn by legendary Bulldog quarterback - Frank Sinkwich, the school’s first Heisman Trophy winner and consensus All-American in 1942. The 1941 Bulldogs posted a 9-1-1 record under head coach - Wallace Butts. The ‘Dogs defeated TCU in the January 1, 1942 Orange Bowl by a score of 40-26; Sinkwich’s performance in the annual classic is considered one of the greatest performances in Orange Bowl history. In 1954, ‘Fireball Frankie’ was inducted into the College Football Hall of Fame. Sinkwich is a member of the University of Georgia Circle of Honor, the school’s highest tribute paid to former athletes and coaches. In 1942, Sinkwich was selected as the Heisman Trophy Winner, college football’s highest honor. Sinkwich was a first found selection in the NFL draft and enjoyed two All-Pro seasons with the Detroit Lions and was also named MVP of the NFL in 1944. Here’s what our friends at Wikipedia have to say about Frank Sinkwich. In 1964, Sinkwich was inducted into the State of Georgia Sports Hall of Fame. The Bulldogs of 1941 sported red jerseys with white uniform numbers on the front and back. Players wore white pants and silver helmets; the helmet below features a special protective face-mask/chin guard worn by Sinkwich in the Orange Bowl of 1942. 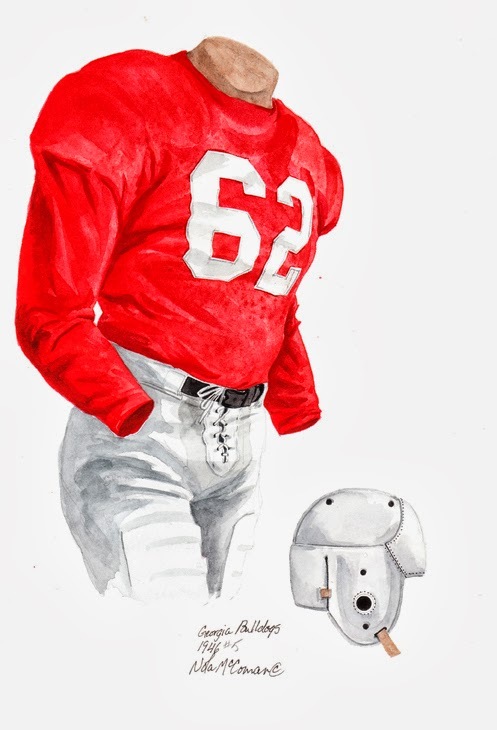 This painting depicts the #62 uniform of University of Georgia football player - quarterback, Charles Louis ‘Charley’ Trippi. Trippi helped lead the Bulldogs to an undefeated season in 1946 (11-0-0) but the team finished 3rd in the AP Rankings. Georgia defeated North Carolina 20-10 in the Sugar Bowl. Trippi is a member of the University of Georgia’s Circle of Honor. 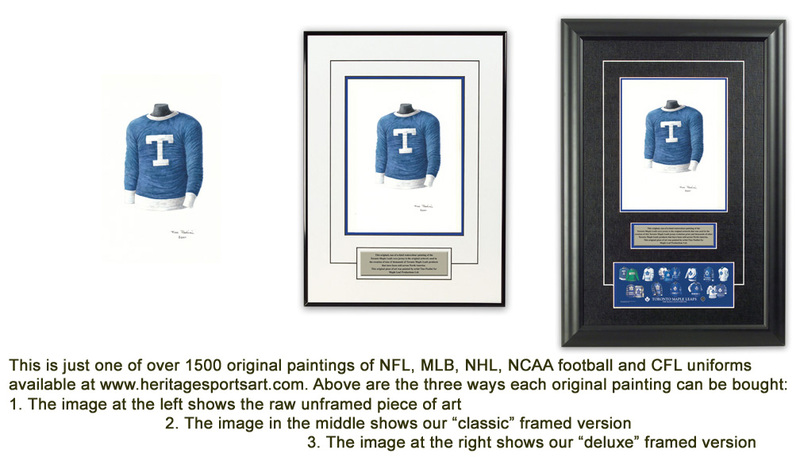 In 1959, Trippi was inducted into the College Football Hall of Fame. Trippi played nine seasons for the NFL’s Chicago Cardinals and is considered one of the most versatile players in NFL history. He was inducted into the Pro Football Hall of Fame in 1968. Here’s what our friends at Wikipedia have to say about Charley Trippi. In 2000-01, Trippi was ranked as the 108th greatest college football player of all-time by College Football News. Coach James Wallace ‘Wally’ Butts patrolled the Bulldog sidelines in 1946; his coaching tenure at Georgia spanned from 1939-1960 and he compiled a record of 140-86-9 during his tenure. The Bulldogs of 1946 sported red, long-sleeved jerseys with white numbers on both the front and back. Players wore silver helmets for protection and white pants. This painting depicts the #10 uniform of University of Georgia football player - quarterback, Francis ‘Fran’ Tarkenton. Tarkenton, a native of Athens, Georgia led the Bulldogs to the 1959 SEC Championship and an Orange Bowl victory over Missouri (14-9). In 1960, he garnered both All-American and Academic All-American honors. Here’s what our friends at Wikipedia have to say about Fran Tarkenton. In 1998, the University of Georgia inducted Tarkenton into its Circle of Honor. Tarkenton was inducted into the College Football Hall of Fame in 1987. When Bud Grant was head football coach of the Minnesota Vikings of the NFL, he called Fran Tarkenton "the greatest quarterback to ever play the game." Tarkenton played 18 seasons in the NFL and led the Vikings to three Super Bowl appearances. In 1975, he was named MVP of the NFL. 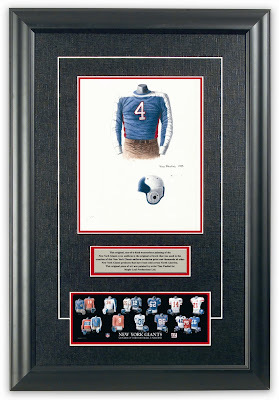 Tarkenton was inducted into the Pro Football Hall of Fame in 1986. Coach James Wallace ‘Wally’ Butts patrolled the Bulldog sidelines in 1959, his second to last year at the helm. Georgia compiled a 10-1-0 record including a stunning come-from-behind-victory over Auburn to capture the SEC title. The Bulldogs of 1959 sported red jerseys with sleeves to the elbow. White numbers appeared on the sleeves, front and back of the jersey. Players wore silver helmets with a red stripe and white pants. 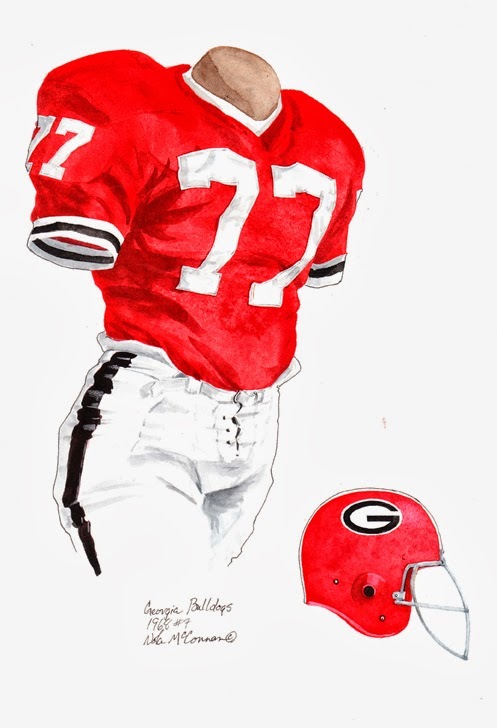 This painting depicts the #77 uniform of University of Georgia football player - defensive tackle, Bill Stanfill. The Cairo, Georgia native captained the Bulldogs to an SEC championship in 1968 and led the squad to 8-1-2 record; the team’s only loss came in the Sugar Bowl against Arkansas (16-2). Stanfill was a consensus All-American in 1968 and during his three seasons at Georgia, the Bulldogs compiled a record of 25-6-2. He was also an Academic All-American and an Outland Trophy winner, presented annually to the nation’s most outstanding lineman. In 2000, the University of Georgia inducted Stanfill into its Circle of Honor. Stanfill was inducted into the College Football Hall of Fame in 1998. The Miami Dolphins selected Stanfill with the 11th overall pick in the 1969 NFL draft. He played eight seasons for the Dolphins including two All-Pro campaigns on both the 1972 and 1973 Super Bowl winning teams. In 1984, Stanfill was inducted into the State of Georgia Sports Hall of Fame. Here’s what our friends at Wikipedia have to say about Bill Stanfill. The legendary Vince Dooley assumed head coaching duties at Georgia in 1964 and went on to patrol the sidelines until 1988. Dooley led the Bulldogs to a 201-77-10 record during his tenure including a national championship in 1980. 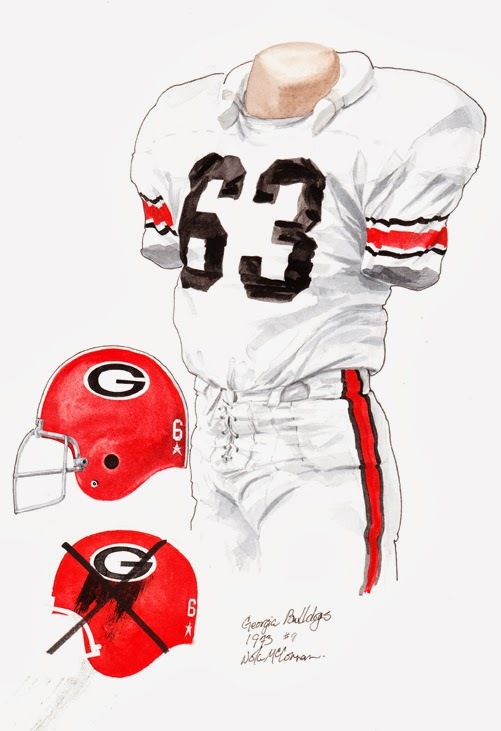 The 1968 Bulldog uniform consisted of red jerseys with white and black striped cuffs on the elbow-length sleeves. White numbers appeared on the sleeves, front and back of the jersey. Players wore red helmets with a white stripe and a stylized ‘G’ on either side of their protective headgear. This painting depicts the #63 uniform of University of Georgia football player - offensive guard, Randy Johnson. The Rome, Georgia native was an All-American in 1975 and three-year letterman (1973-75) with the Bulldogs. The Seattle Seahawks selected Johnson with the 122nd pick in the 1976 NFL draft. He played for the Seahawks in 1976 and for the Tampa Bay Buccaneers from 1977-78. The 1973 Vince Dooley led Bulldogs posted 7-4-1 record including a 17-16 triumph over Maryland at the Peach Bowl. The squad was captained by fullback, Bob Burns. 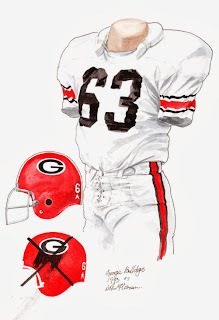 The 1973 Bulldog uniform featured below consisted of a white jersey with red and black stripes on the elbow-length sleeves. Black numbers appeared on both the front and back of the uniform. Players also wore white pants with red and black stripes. The red helmet featured a stylized ‘G’ on each side, a white stripe and the players’ number on the back. 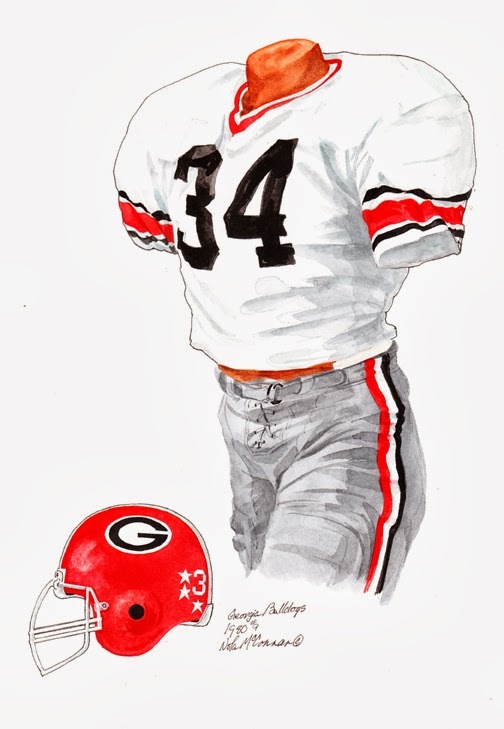 This painting depicts the #34 uniform of University of Georgia football player - running back, Herschel Walker. Walker played three years at Georgia and was unanimous All-America every year. When he left after his junior year, he owned 41 school records, 16 Southeastern Conference records, and 11 NCAA records. As a freshman in 1980, he led Georgia to a 12-0 record and the national championship. Walker placed third in Heisman Trophy voting in 1980, second in 1981, first in 1982. After he left Georgia, Walker played three years in the U. S. Football League with the New Jersey Generals 1983-1985, and 12 years in the National Football League with Dallas, Minnesota, Philadelphia, and the New York Giants 1986-97. Walker was inducted into the College Football Hall of Fame in 1999. In 2000, Walker was inducted into the State of Georgia Sports Hall of Fame. Here’s what our friends at Wikipedia have to say about Herschel Walker. In 2000-01, Herschel Walker was ranked as the 2nd greatest college football player of all-time by College Football News. Vince Dooley led the Bulldogs to a perfect 12-0-0 season en route to an SEC and National Championship. Georgia defeated Notre Dame 17-10 in the Sugar Bowl to cement their 1980 title drive. The 1980 Bulldog uniform featured below consisted of a white jersey with red and black striping on the sleeves. Black numerals adorned the front and back of the jersey. Players sported silver pants with a red, white and black stripe down the side of each leg. Helmets were red with a stylized ‘G’ on each side, a stripe down the center of the helmet and the players’ number on the back of the helmet. 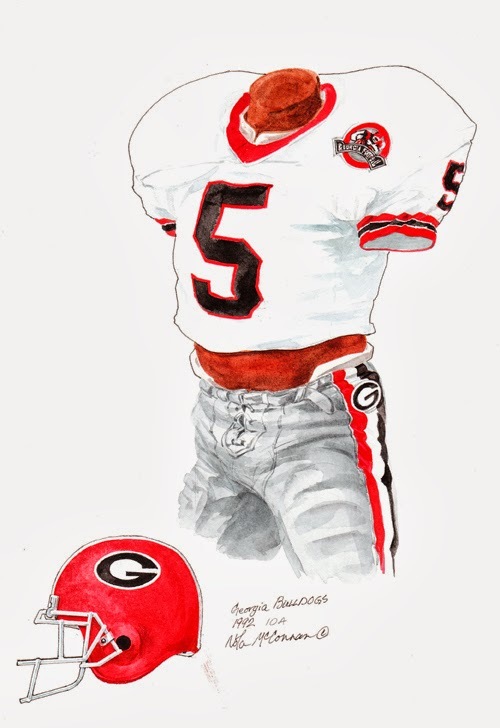 This painting depicts the #5 uniform of University of Georgia football player - running back, Garrison Hearst. Hearst played for 10 seasons in the NFL mostly with San Francisco. The Phoenix Cardinals selected Hearst with the 3rd overall pick of the 1993 NFL draft. Here’s what our friends at Wikipedia have to say about Garrison Hearst. Ray Goff took over the head coaching duties from the legendary Vince Dooley in 1989. The ’92 Bulldogs compiled a 10-2 record under Goff including a 21-14 victory over Ohio State in the Citrus Bowl. 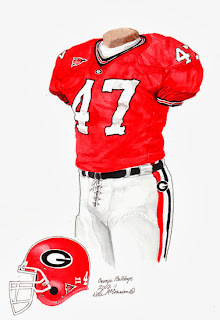 The 1992 Bulldog uniform featured below consisted of a white jersey with red and black striping on the sleeves. Black numerals adorned the front and back of the jersey. This jersey features a ‘100 Years of Georgia Football 1892-1992’ patch on the left shoulder. Players sported silver pants with a red, white and black stripe down the side of each leg. Helmets were red with a stylized ‘G’ on each side, a stripe down the center of the helmet and the players’ number on the back of the helmet. 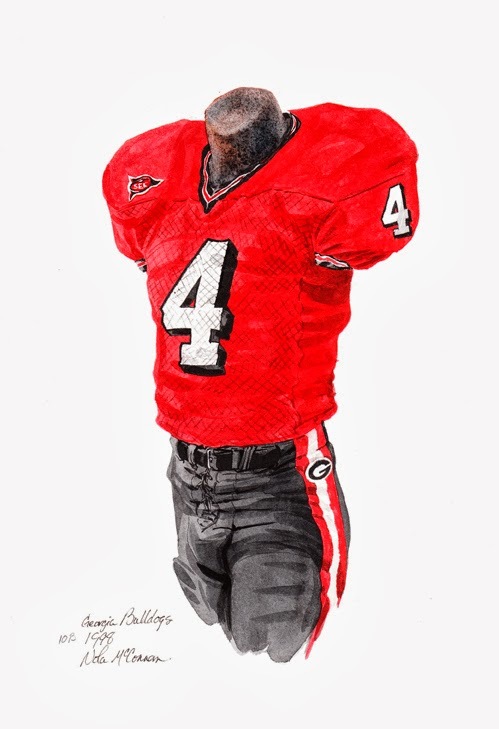 This painting depicts the #4 uniform of University of Georgia football player - defensive back and co-captain, Roland ‘Champ’ Bailey. Bailey was selected in the first round (7th overall) by the Washington Redskins in the 1999 NFL draft. He played five seasons in Washington before joining the Denver Broncos for a great run. Here’s what our friends at Wikipedia have to say about Champ Bailey. In 2000-01, Champ Bailey was ranked as the 136th greatest college football player of all-time by College Football News. The 1998 Bulldogs posted a 9-3-0 record including a thrilling 35-33 victory over Virginia in the Peach Bowl. Georgia was coached by Jim Donnan, who took over from Ray Goff after the 1995 season. The 1998 Bulldog uniform featured below consisted of a red jersey with white numbers outlined in black on the sleeves, front and back of the uniform. Players sported black pants with red and white stripes down the side of each leg. A stylized ‘G’ patch appears on the hip of the pants. The red helmet is adorned with a stylized ‘G’ on each side, and a stripe down the center of the helmet. This painting depicts the #47 uniform of University of Georgia football player - defensive end, David Pollack. In 2004, Pollack won the Rotary Lombardi Award, given annually to college football’s best lineman or linebacker. Pollack was selected in the first round (17th overall) by the Cincinnati Bengals in the 2005 NFL draft. He suffered a career-ending injury in the second game of his second season.Follow his NFL career here. Here’s what our friends at Wikipedia have to say about David Pollack. The 2002 Bulldogs captured the SEC championship for the first time since 1982. Head Coach Mark Richt led Georgia to a 13-1 record including a 30-3 win over Arkansas in the SEC Championship game and 26-13 victory over Florida State in the Nokia Sugar Bowl. The Bulldogs finished the 2002 campaign ranked #3 in the nation in both the USA Today/ESPN and AP polls. The 2002 Bulldog uniform featured below consisted of a red jersey with white numbers outlined in black on the shoulders, front and back of the uniform. The jersey also featured two patches; an SEC patch on the right shoulder and ‘G’ patch under the ‘v’ of the neck collar. Players sported silver pants with red, white, and black stripes down the side of each leg. A stylized ‘G’ patch appears on the hip of the pants. The red helmet is adorned with a stylized ‘G’ on each side, a stripe down the center of the helmet, and the players’ number on the back. 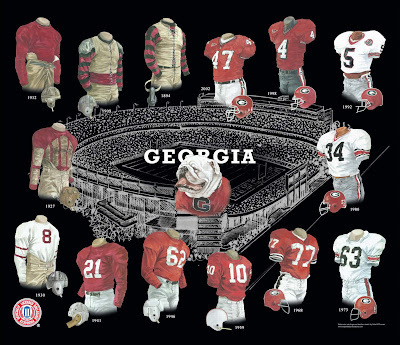 If you love the University of Georgia and the history of Bulldogs football, you might really love to own an original piece of artwork celebrating the team's historic uniforms as seen in the poster at the top of this blog - you can actually own one of those original pieces of art! There are only 15 pieces of original art available for sale, and when these 15 are sold, that's it, they're all sold out. 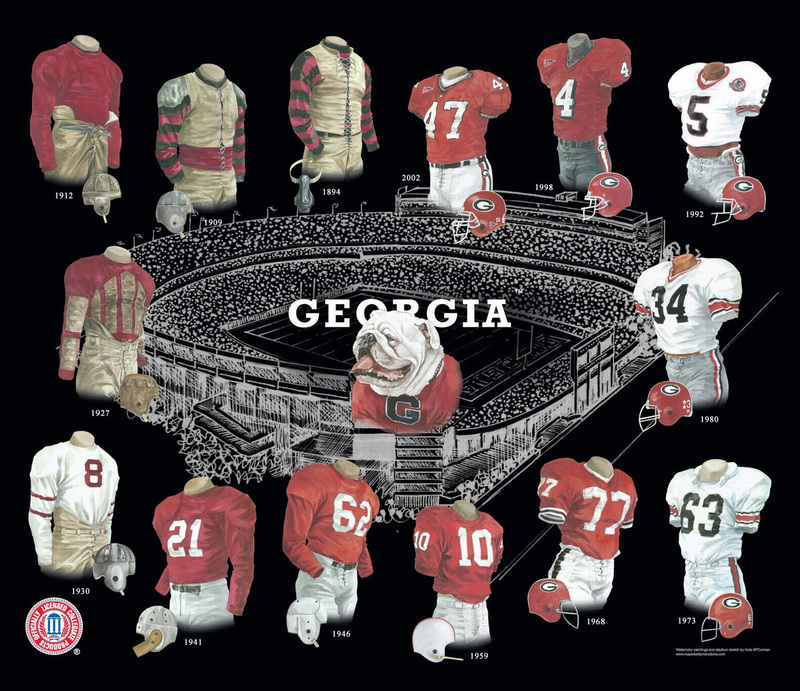 If you would like more information about this great artwork including the three ways you could purchase each piece, please visit our Georgia Bulldogs YouTube video at www.youtube.com/watch?v=WxSzTiSLgpk or go directly to the artwork website www.heritagesportsart.com/Georgia-Bulldogs-c84/ where you can see and purchase the artwork. This blog was written by Scott Sillcox and was last updated August 20, 2010. I have tried to ensure the accuracy of the information, but I am human and can make mistakes. If you believe I have made a mistake, please let me know by email at ssillcox@rogers.com !